Breaking down in the middle of nowhere is never fun, so give your clients the tools they need to be prepared. 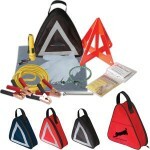 This promotional safety automotive kit will ensure that your customer’s vacation or road trip runs smoothly and they will think of you the next time they need your products or service. Includes 1 8′ 10 gauge CCA mini booster cables, 1 Tee Pee triangle – 2 sided triangle, 1 medium flashlight, 2 heavy duty AA batteries, 19 piece first aid kit, 1 emergency poncho, 1 tie down strap, 2 vinyl gloves (1 pair), 1 foam knee pad and 1 tire gauge.